Founder of the Dog Psychology Center in Los Angeles , CESAR MILLAN is the star of Dog Whisperer with Cesar Millan on the National Geographic Channel. 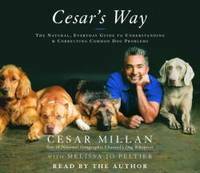 In addition to Cesar’s educational seminars and work with unstable dogs, he and his wife have founded the Cesar and Ilusion Millan Foundation, a nonprofit organization dedicated to providing financial support and rehabilitation expertise to shelters. A native of Culican, Mexico, Cesar lives in Los Angeles with his wife, Ilusion, and their two sons, Andre and Calvin. MELISSA JO PELTIER, an executive producer and writer of Dog Whisperer with Cesar Millan, has been honored for her film and television writing and directing with an Emmy, a Peabody, and more than fifty other awards. She lives in Nyack, New York, with her husband, writer-director John Gray, and stepdaughter, Caitlin. From the Hardcover edition. Random House Audio. New. Brand New! Audio CD. Shrink wrapped! Quality guaranteed! In original artwork/packaging unless otherwise noted. 2006-04-06. Good. Ships with Tracking Number! INTERNATIONAL WORLDWIDE Shipping available. May not contain Access Codes or Supplements. May be ex-library. Shipping & Handling by region. Buy with confidence, excellent customer service!